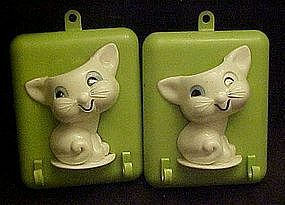 Very vintage plastic wall pockets for the kitchen. White kitty will hold pens or ?. Two hooks on each one would be great to hang your pot holders from. Measures 4" x 5" and there are no chips or cracks. Some of the paint is worn, but this only adds character. Lime/jadite green back with white kitty cat. Sold as a pair.